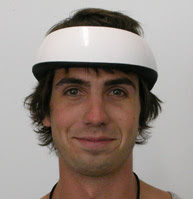 A while back we posted about an Australian 'motoring helmet' designed to protect motorists' heads in car accidents. It was designed in the late 1980's. 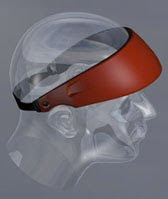 The Centre has been evaluating the concept of a protective headband for car occupants. 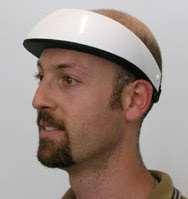 In about 44 percent of cases of occupant head injury, a protective headband, such as the one illustrated, would have provided some benefit. One estimate has put the potential benefit of such a device (in terms of reduced societal Harm) as high as $380 million, compared with $123 million for padding the upper interior of the car. This benefit derives from the fact that in a crash, the head strikes objects other than those that could be padded inside the car. CASR were investigating the benefits of padding the inside of a car, which is a legal requirement in some jurisdictions. They discovered that although the head may strike any of a number of places in a car, many of which would be difficult to pad, that about half of all serious head injuries occurred to the forehead, side of the head or behind the ears. From these findings CASR embarked upon a project to develop a headband which could protect these areas of the head in a car collision. The BBC wrote about the new product here. Any bicycle advocate worth their salt will dedicate the majority of their time to promoting cycling positively and highlighting the many benefits of cycling for the individual and for society. Unfortunately, it proves necessary to spend a great deal of time debunking well-established myths about the 'dangers' of cycling. The health benefits of cycling - both for the individual and society - are 20 times greater than the relatively small risk of serious accident. This is where the focus should lie. Increasing the number of cyclists in any urban environment fights obesity and a host of illnesses associated with our modern sedentary lifestyles. More citizens choosing the bicycle reduces injury rates. If you double the number of cyclists in a city, the risk of injury falls by one-third, due to the Safety in Numbers principle. 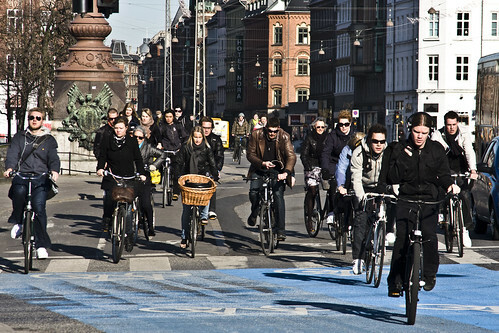 For every kilometre cycled, society enjoys a net PROFIT of 1.22 kroner [$0.23]. On the other hand, for every kilometre travelled in a car, society suffers a net LOSS of 0.69 kroner [$0.13]. Politicians here, like anywhere else, love cost-benefit analysis. Cycling and investment in infrastructure is fantastically profitable for a society. The Copenhagen calculations are based, among other factors, on reduced costs for wear and tear on the roads, the health benefits of cycling and the extended lives of healthier citizens. We're not even talking about testosterone cycling, merely pedalling to work, the supermarket, the cinema, etc. When more people cycle, there are fewer sick days, fewer hospital admissions and the working population is generally more productive. It is even more unfortunate that many of the people who are eager to keep the myths about cycling alive are cyclists. More often than not, cyclists who enjoy the adrenaline version of cycling and not the casual urban transport style on the rise in cities all over the world. Imagine if the most vocal advocates of 'going for walks around town' were racewalkers and racewalking clubs. Copenhagenize.com, in the interest of exploring how logic works - or rather doesn't - thinks that the focus on the mythical dangers of cycling is misplaced. In logical terms, proponents of bicycle helmets should extend their campaign to include helmets for pedestrians and motorists. Anything less than that is misleading, statistically incorrect and just plain ridiculous. Promoting the positive aspects of cycling seems so blatantly obvious, but it is, sadly, an uphill battle and has been for the past few decades. The time is ripe for Bicycle Culture 2.0. The more people who promote cycling as positive, the quicker we arrive.